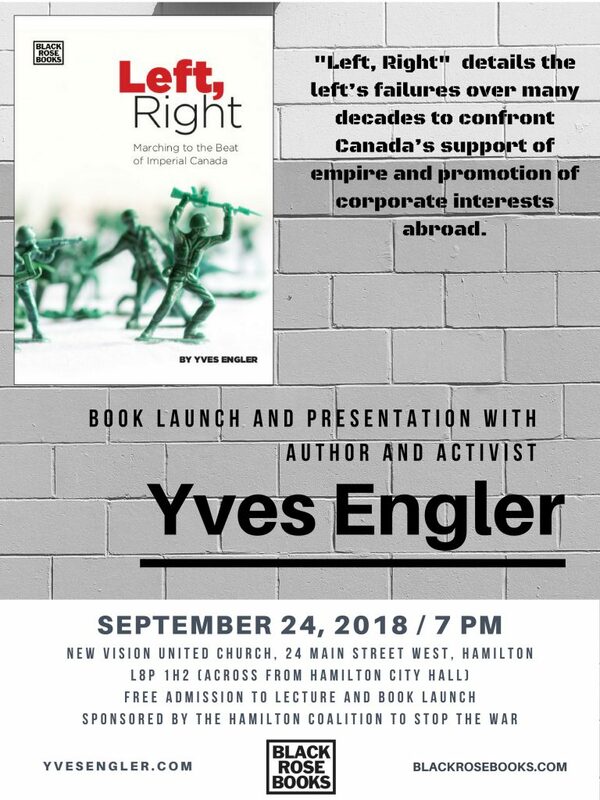 Yves Engler launches his latest book “Left, Right — Marching to the Beat of Imperial Canada” in Hamilton. “Left, Right — Marching to the Beat of Imperial Canada” will make some on the ‘left’ angry! It details the left’s failures over many decades to confront Canada’s support of empire and promotion of corporate interests abroad: the social democratic NDP has backed unjust wars; Canadian unions supported the creation of NATO, Korean War, assassination of Patrice Lumumba, Bay of Pigs invasion and coup in Haiti; left commentators concede too much to the dominant ideology, whether it’s Stephen Lewis praising Canada’s role in Africa, Linda McQuaig turning Lester Pearson into an anti-US peacenik or many others mindlessly demanding more so-called peacekeeping. Why? Left nationalist ideology, both Canadian and Quebecois, has warped foreign policy discussion; viewing their country as a semi-colony struggling for independence has blinded progressives to our long history of supporting imperialism. But the book is not just critical — it also offers solutions to help create a just foreign policy. Dubbed “Canada’s version of Noam Chomsky” (Georgia Straight), “one of the most important voices on the Canadian Left” (Briarpatch), “in the mould of I. F. Stone” (Globe and Mail), “part of that rare but growing group of social critics unafraid to confront Canada’s self-satisfied myths” (Quill & Quire), “ever-insightful” (Rabble), “Chomsky-styled iconoclast” (Counterpunch) and a “Leftist gadfly” (Ottawa Citizen), Yves Engler (yvesengler.com) has ten published books. New Vision United Church is located diagonally across from Hamilton City Hall, where there is ample paid parking. The wheelchair-accessible church is also adjacent to the HSR’s MacNab Street Transit Terminal. There will be FREE ADMISSION to the event, which will include a lecture by Yves, a Q&A, and a book signing and autographing. The book sells for $25. The Hamilton Coalition To Stop The War is, as the name suggests, an antiwar group, whose views and activities are described in this Facebook account and on our website: hcsw.ca. We are thrilled to provide a venue to Yves for a successful book launch for the tenth year in a row. And we would like our supporters to know that, in co-sponsorship with Solidarity for Palestinian Human Rights (McMaster), we have helped to schedule a lunchtime lecture by Yves for 12:30 pm at McMaster University on Monday, September 24, at 12:30 pm, room to be announced.